NOTICE: Requires the base game Borderlands The Pre-Sequel in order to play. Activation key must be used on a valid Steam account, requires internet connection. 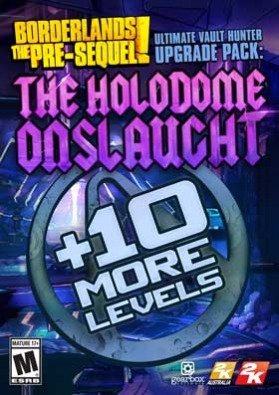 ABOUT THE GAME	With all new narrative content, this add-on begins as Vault Hunters Axton and Gaige catch up on the story thus far via The Holodome Onslaught, a new challenge arena that lets players fight through wave after wave of exc… iting enemies and bosses. While the veteran Vault Hunters join the rest of the crew at Crimson Raiders HQ and learn of recent events, players will face off against some of the game’s most memorable badasses to earn awesome, new weapons and gear along with radical new heads and skins! As bonus content, this download also includes the Ultimate Vault Hunter Upgrade Pack, which raises the level cap and gives your characters 10 new levels plus 10 new skill points to earn!SYSTEM REQUIREMENTS Minimum OS: Windows XP SP3, SOFTWARE: Steam Client Processor: 2.4 GHz Dual Core Processor Memory: 2048 MB/2048 MB Vista Hard drive: 13 GB free Video memory: 256 MB VRAM, DirectX 9 Video card: NVIDIA GeForce 8500 / ATI Radeon HD 2600 Sound card: DirectX 9 Compliant Recommended OS: Windows XP SP3/Vista/Win 7/Win 8, SOFTWARE: Steam Client Processor: 2.3 GHz Quad Core processor Memory: 2048 MB/2048 MB Vista HARD DRIVE: 20 GB free Video memory: 512MB VRAM, DirectX 10 Video card: NVIDIA GeForce GTX 560 / ATI Radeon HD 5850 Sound card: DirectX 9.0 c Compliant Other Requirements & Supports: Initial installation requires one time internet connection for Steam authentication; software installations required (included with the game) include Steam Client, directX 9, Microsoft .NET 4 Framework, Visual C++ Redistributable 2005, Visual C++ Redistributable 2008, Visual C++ Redistributable 2010, and AMD CPU Drivers (XP Only/AMD Only). Windows Imaging Component (Windows XP 64-Bit only) Internet connection and acceptance of Steam™ Subscriber Agreement required for activation. See www.steampowered.com/agreement for details. © 2014 IPerion, LLC. Published and distributed by 2K. Gearbox and Borderlands, and the Gearbox Software and Borderlands logos, are registered trademarks, The Pre-Sequel is a trademark, and all are used courtesy of Gearbox Software, LLC. 2K, 2K Games, 2K Australia, and their respective logos are trademarks of Take-Two Interactive Software, Inc. The ratings icon is a trademark of the Entertainment Software Association. Unreal® is a registered trademark of Epic Games, Inc. Unreal ® Engine, copyright 1998 – 2014, Epic Games, Inc. All rights reserved. Uses Bink Video. Copyright © 1997-2014 by RAD Game Tools, Inc. This software product includes Autodesk® Scaleform® software,© 2014 Autodesk, Inc. All rights reserved. Autodesk Scaleform is a registered trademark of Autodesk, Inc., and/or its subsidiaries and/or affiliates in the USA and/or other countries. Powered by Wwise © 2006 - 2014 Audiokinetic Inc. © 2014 NVIDIA Corporation. NVIDIA, the NVIDIA logo, GeForce, PhysX, The Way it's meant to be played, and 3D Vision are trademarks and/or registered trademarks of NVIDIA Corporation. Dolby and the double-D symbol are trademarks of Dolby Laboratories. All other marks are property of their respective owners. All Rights Reserved.The content of this videogame is fictional. The makers and publishers of this videogame do not in any way endorse, condone or encourage engaging in any conduct depicted in this videogame.